March 13, 2019 – Sebring, Florida – PR1/Mathiasen Motorsports will officially expand its operations with a new LMP3 entry in the IMSA Prototype Challenge category this weekend at the Mobil 1 Twelve Hours of Sebring Presented by Advance Autoparts with drivers Scott Huffaker and Mike Guasch. 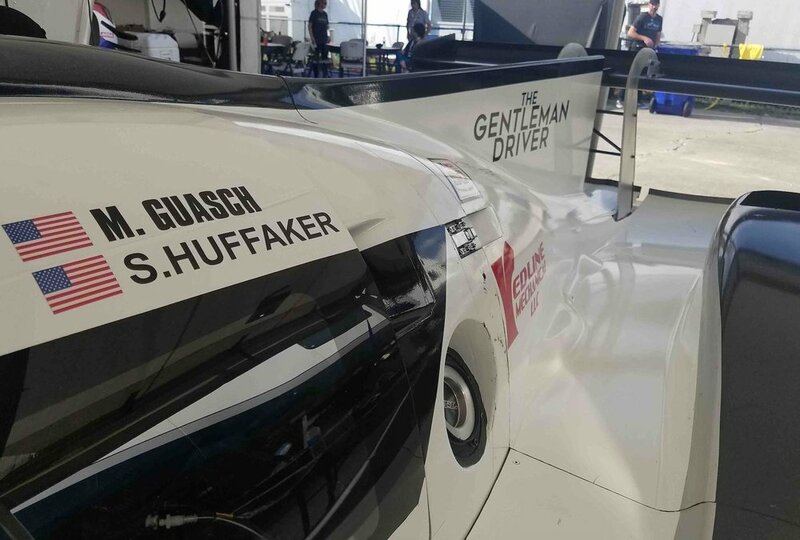 Huffaker will be making his IMSA debut this weekend after winning the 2015 Pacific Formula 1600 Championship and placing 3rd in the 2016 Pacific Formula 2000 Championship with PR1/Mathiasen Motorsports. The American also raced with PR1/Mathiasen Motorsports in the finale of the 2018 Formula 4 United States Championship Powered by Honda at Circuit of The Americas. Guasch is also no stranger to the PR1/Mathiasen Motorsports crew. The California native has an extensive racing resume dating back to the American Le Mans Series where he won the Prototype Challenge Championship title with PR1/Mathiasen Motorsports in 2013. Guasch’s next decoration while being paired with PR1/Mathiasen Motorsports came in 2015 when they placed 2nd overall in the United Sports CarChallenge in the Prototype Challenge class. In 2016 Guasch took his career abroad in the European Le Mans series where he won another championship title in the LMP3 category. Due to the demands of his off-track career and the launch of his racing documentary “The Gentleman Driver,” the sixty-one-year-old took a break from driving in 2017 and 2018 and will use the 12 Hours of Sebring as a season opener in preparation for the 2019 European Le Mans Series. “I’m really excited I got the call from Bobby last minute and got the chance to come out here to Sebring and get some time in the LMP3 car. I’m heading off to Europe in three weeks, so this is a nice warm-up race for me. March 12, 2019 – Sebring, Florida – PR1/Mathiasen Motorsports announced today that Anders Fjordbach will join their LMP2 program for the second race of the 2019 IMSA WeatherTech SportsCar Championship, the 12 Hours of Sebring. Fjordbach joins PR1/Mathiasen Motorsports with extensive endurance racing experience. The Denmark native has won two 24 Hours of Dubai titles and finished on the podium two additional times. He has raced in seven other 24-hour races including the 24 Hours of Spa and Nürburgring. The twenty-eight-year-old will be a part of the IMSA WeatherTech SportsCar Championship for the first time after competing in the Blancpain GT Endurance Series, Asian Le Mans Series, and European Le Mans Series. “Sebring is one of the classics and one of the races I have watched for many years while racing in Europe and Asia. I am so happy to make my American racing debut at Sebring with PR1/Mathiasen Motorsports.
" I am looking forward to the upcoming 12 hours of Sebring weekend. We have a great group of drivers who demonstrated at Daytona that we can be fast and if our luck holds out I'm confident we will be competing for P1 in our class at the end of the 12 hours. In 2019 we have added another ORECA 07 to our stable and have also purchased a Ligier P3 to compete in the Prototype Challenge class which should greatly enhance our driver development program. This weekend we will be competing for the first time with both cars. It will be a busy weekend for the team. But I'm sure Bobby and crew will be up to the task." January 30, 2019 – Daytona, Florida – PR1/Mathiasen Motorsports finished 4th at the Rolex 24 Hours at Daytona scoring valuable points for the rest of the 2019 IMSA WeatherTech SportsCar Championship. 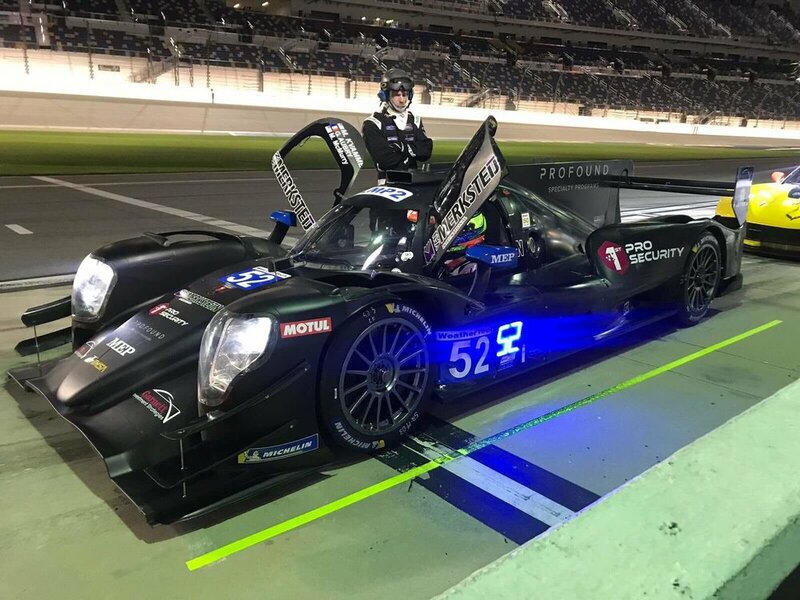 High hopes surrounded PR1/Mathiasen Motorsports after their performance at the Roar Before the Rolex 24 where they posted the fastest lap time in the LMP2 class. When the historic weekend finally came around, the team was prepared and had a full line-up of drivers that included Matt McMurry, Gabriel Aubry, Mark Kvamme, and Enzo Guibbert. Aubry qualified the #52 ORECA 07 in 2nd with a time of 1:36.42. Aubry gave PR1/Mathiasen Motorsports a clean start to the 57th running of the Rolex 24 Hours at Daytona and maintained an excellent pace for the first few hours of the race. Significant rainfall was looming on the event and accidents began to happen in the early stages of the shifting weather. Kvamme suffered a spin that lead to another car making contact with the right rear of the #52. The car was sent back to the garage where the crew of PR1/Mathiasen Motorsports worked diligently to get back on track. Although laps accumulated between PR1/Mathiasen Motorsports and the rest of the LMP2 entries, the team knew it was most important to finish and that anything can happen in this level of an endurance race. Around four or five in the morning, the weather became relentless. Many competitors fell victim to the inclement conditions and never made it back out on the track. Race control threw the first red flag on Sunday morning where they waited over an hour for the rain to let up. Attempting to go green again, the officials did their best to keep the race going but were forced to have the competitors follow a safety car under yellow for two hours. Another green was attempted, but the Rolex 24 at Daytona was eventually cut eleven minutes short. As the checkered flag waved, PR1/Mathiasen Motorsports saw had survived the fight finishing in 4th. February 7, 2019 – Daytona, Florida – PR1/Mathiasen Motorsports announced today that it will expand its operations throughout the IMSA WeatherTech SportsCar Championship by adding a new LMP2 ORECA 07 in order to double up its LMP2 team and also adding a new LMP3 entry into the IMSA Prototype Challenge category. January 24, 2019 – Daytona, Florida – PR1/Mathiasen Motorsports is heading into the Rolex 24 at Daytona, the first race weekend of the 2019 IMSA WeatherTech SportsCar Championship, with great momentum after posting the fastest lap time of the LMP2 class during the Roar Before the Rolex 24 earlier this month. The American team is also pleased to announce their fourth driver, Frenchman Enzo Guibbert, to complete their lineup. The 57th running of the Rolex 24 at Daytona will be the first to include the LMP2 class among the three other classes competing in the event. There will be 47 cars total, with PR1/Mathiasen Motorsports battling against three other LMP2’s for the top step of the podium and a brand-new Rolex watch. The driver lineup is complete with Matt McMurry, Gabriel Aubry, Mark Kvamme, and the final addition of Enzo Guibbert. racing resume includes a third-place finish in the 2016 European Le Mans Championship, another third-place title for the 2018 GT4 International Cup, as well as valuable experience from the 24 Hours of Le Mans. The Rolex 24 at Daytona will be the Frenchman’s debut to racing in the United States. Track action beings today with two practice sessions in the first half of the day, qualifying, and then a final night practice session to wrap up. Qualifying for the LMP2 class will be held from 4:25-4:40 P.M. EST, which will determine the #52 ORECA’s grid position for the Rolex 24 at Daytona. A final, fourth practice session will be held tomorrow morning, and then everyone at PR1/Mathiasen Motorsports will have their focus on Saturday afternoon, 2:35 P.M. EST – the start time of the 2019 Rolex 24 at Daytona. Fresno, California - August 16, 2018 - AFS/PR1 Mathiasen Motorsports announced today that the team has acquired a brand new ORECA 07 LMP2 which it will start using at the next round of the IMSA Weathertech SportsCar Championship at WeatherTech Raceway Laguna Seca next Sept 7-9. The team will renew its relationship with ORECA after many years of victories, podiums and championships together in the LMPC class. 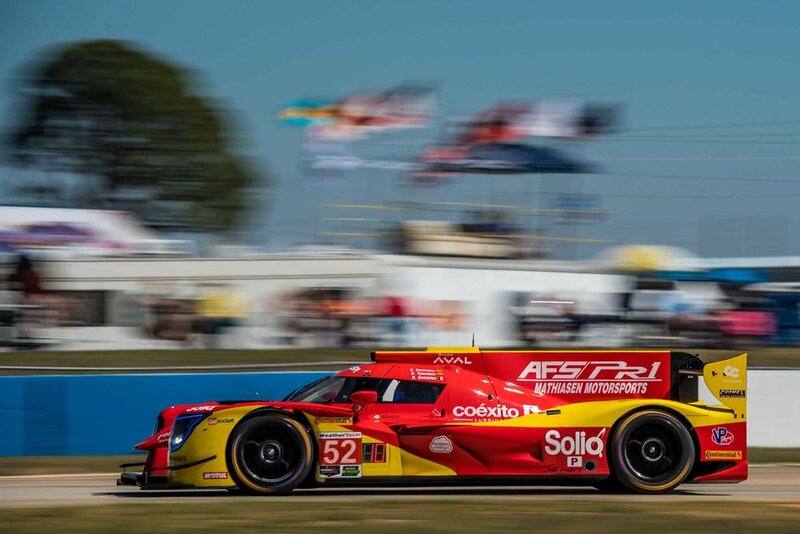 The California based squad plans to enter the #52 AFS/PR1 Mathiasen Motorsports Oreca 07 into the last two events of the 2018 championship, in preparation for a full season effort in the newly announced standalone LMP2 pro/am class in 2019. The team drivers Gustavo Yacaman and Sebastian Saavedra will get a chance to drive their new machine during the first session of the Laguna Seca event, as the duo looks to capture their first podium of the season. "This has been an eventful week for the team. The separation of the DPi and LMP2 classes in 2019 is something Leslie and I feel was necessary and a very welcome change for the future. And now we have been able to purchase our new equipment from ORECA in time to be able to compete at Laguna Seca, our home track, and at Road Atlanta. This will give us the valuable experience we'll need to prepare for 2019 giving Bobby and crew the opportunity to once again return to the podium finishes that have escaped us since our move up to the prototype class. We couldn't be any more enthusiastic about the rest of this season and next year. " “We are happy to welcome back Bobby and the AFS/PR1 Mathiasen Motorsports team in the ORECA family. We know them since many years from the LMPC era and not racing together in LMP2 was a kind of unfinished story. It’s a strong commitment from the team and we are looking forward to see AFS/PR1 Mathiasen Motorsports on track with ORECA 07. Laguna Seca will be definitely a special race: first time for AFS/PR1 Mathiasen Motorsports with the ORECA 07 and on their home race. There will be a learning process but we know how great the team can do and we are ready to take on this challenge by bringing our support. Elkhart Lake, Wisconsin – August 6, 2018 – AFS/PR1 Mathiasen Motorsports leaves Road America with a 13th place finish at the 8th round of the 2018 IMSA Weathertech SportsCar Championship after an incident ended their race prematurely. It all began as a regular start to the weekend. AFS/PR1 Mathiasen Motorsports had not participated in any testing at Road America so practice was spent getting the team's drivers and crew acclimated to the track and developing the setup of the Ligier JSP217. The pace and strategy looked promising going into the qualifying session. On what was set up to be Gustavo Yacaman’s fastest lap, the Columbian suffered a tire puncture on the rear left that put an end to qualifying, leaving him with the 10th place on the grid for the start of the race. Bowmanville, Ontario, Canada – July 9, 2018 – What looked to be a very promising weekend for AFS/PR1 Mathiasen Motorsports turned to be riddled with obstacles at the seventh round of the 2018 IMSA Weathertech SportsCar Championship resulting in a 9th place finish. The event started off with positive momentum after AFS/PR1 Mathiasen Motorsports made huge progress in a very competitive qualifying session. It looked as if the 7th spot on the grid would be where Sebastian Saavedra would start the race, but a penalty sent one of the cars to the back, moving them up to 6th place. The start was fairly tame and eventually, a yellow flag blanketed the field, but the #52 Liger JS P217 stayed out, waiting to pit until another yellow where they changed the left side tires only. AFS/PR1 Mathiasen Motorsports had the pace but struggled to fight with the leaders as the top ten maintained a tight line. In Saavedra's second stint he came over the radio and reported he felt an issue with the car. Shortly after sharing this information, the front right tire fell off. The incident is being investigated by AFS/PR1 Mathiasen Motorsports, as it’s a very strange failure. This was followed by two more setbacks in the form of penalties, which left Gustavo Yacaman in survival mode to finish the race in 9th and continue collecting points for the IMSA Weathertech SportsCar Championship. AFS/PR1 Mathiasen Motorsports will return to racing in the United States at Road America on August 5th. "It was a pretty tough weekend. We improved the car little by little until qualifying, where Sebastian did a good job and we had a great car. For warm-up and the race, we missed on the setup a bit so we didn’t have the pace to keep up with the leaders. Everything that could go wrong went wrong during the race, Sebastian lost a tire at the end of his second stint so that really set us back. We have a month before the next race so now we need to analyze and figure out how to come back stronger." Watkins Glen, New York – June 27, 2018 – AFS/PR1 Mathiasen Motorsports welcomes Will Owen to join Sebastian Saavedra and Gustavo Yacaman to take on the Sahlen’s Six Hours of the Glen in the #52 Liger JS P217. The event marks the halfway point of the 2018 IMSA Weathertech SportsCar Championship, being the sixth round of the 12-race season. Owen is no stranger to the AFS/PR1 Mathiasen Motorsports crew after testing a prototype for the very first time with PR1 back in 2016, and making his IMSA racing debut with them at Long Beach in 2017. Since then, the American has made leaps and bounds in his sportscar career finishing second in the 2017 European Le Mans Series championship, fourth at this year’s Rolex 24, and most recently on the podium of the 2018 24 Hours of Le Mans just two weeks ago with teammates Juan Pablo Montoya and Hugo de Sadeleer. Last year, PR1 Motorsports had a strong showing at the Six Hours of the Glen starting from the front row and finishing 4th, making it their best result of the season. AFS/PR1 Mathiasen Motorsports will be looking to better their 2017 4th place finish after being the top LMP2 car in the past two rounds of the 2018 IMSA Weathertech SportsCar Championship. Track action beings on Friday morning, June 29th at 10:25 a.m. EDT with the first practice session of the weekend. Two more practices will take place before Qualifying goes green on Saturday from 12:25 p.m. to 12:40 p.m. A final warm-up will kick off race day and the battle for the podium of the Sahlen’s Six Hours of the Glen will begin at 9:45 a.m. EDT on Sunday, June 30th. You can find more details and who to tune into live sessions at https://sportscarchampionship.imsa.com/events/2018-sahlens-six-hours-glen. “We are very happy to welcome Will to our team, even though I haven’t had the chance to meet him in person I've heard nothing but good things about him and he brings a lot of LMP2 experience with our Ligier JS P217 chassis, not to mention that he's coming off a very strong podium result at the 24 Hours of Le Mans. It's a shame not to have Roberto Gonzalez with us but we are definitely looking forward to another strong weekend for the AFS/PR1 Mathiasen Motorsports team and we hope that the Watkins Glen track will be a good venue for our car." "We have followed Will's career for years now and we're thrilled that he can join us again for Watkins Glen. He has proven to be a very accomplished endurance racer, and with his experience in Europe, he will be a great addition to our team. Last year we were very strong at Watkins Glen and we are confident that we can once again be fighting for our best result of the season this weekend." Detroit, Michigan – June 4, 2018 – AFS/PR1 Mathiasen Motorsports finished their #52 Liger JS P217 in 8th place at the Chevrolet Sports Car Classic. The race around Belle Island was the second street circuit of the 2018 IMSA Weathertech SportsCar Championship and was the second race in a row that AFS/PR1 Mathiasen Motorsports finished as the top LMP2 entry. What started as a shaky weekend ended up on a positive note thanks to all the hard work from the AFS/PR1 Mathiasen Motorsports team and drivers. Qualifying was smoother than the prior practice sessions, but the #52 still found itself starting back in 13th place on the grid. The crew of AFS/PR1 Mathiasen Motorsports worked overnight from qualifying to race day to make the car better for Sebastian Saavedra, who spent his birthday starting the race. Saavedra felt the improvement in the car immediately and gained several positions on the start. Finding more of the pace and running off a good pit strategy, Saavedra ran all the way up to 4th place and was holding his spot amongst the competitive field. Time was lost when the drivers swapped over and found trouble getting a safety belt to cooperate. Gustavo Yacaman was pushed down to 10th as he made his way into the race, but that didn’t get in the way of AFS/PR1 Mathiasen Motorsports finding a way to gain some of those positions back. Knowing they were good on fuel for the remainder of the race, the engineers of AFS/PR1 Mathiasen Motorsports advised Yacaman to push the drivers ahead of him who had not pitted for extra fuel in the hopes they would exhaust their supply. Their efforts paid off and Yacaman was able to push himself into 8th place before crossing the finish line. Next up for AFS/PR1 Mathiasen Motorsports is the Sahlen’s Six Hours of The Glenn at Watkins Glenn International. Roberto Gonzalez will rejoin Gustavo Yacaman and Sebastian Saavedra to fight for their first podium of the season on Sunday, July 1st. 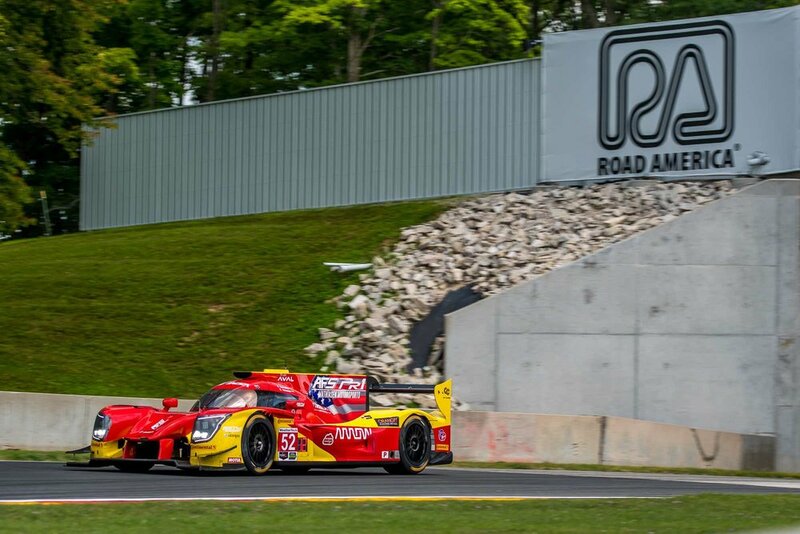 “We struggled most the weekend with our Ligier chassis, trying everything that we could possible to throw at the car since we didn't have the speed at first which was disappointing especially after being the quickest LMP2 at Mid-Ohio. With the efforts of Tim Lewis, our great engineer and Sebastian’s and Gustavo's feedback, we went for radical car changes that have not been tried by our team. We had a decent race car obtaining another top ten finish with an eighth place finish and again the best finish for an LMP2 car. The team is looking forward to Watkins Glen, a true road course where our car should be pretty quick." “I'm very proud of the work of the AFS/PR1 Mathiasen team. It was a difficult start to the weekend for us but everyone kept their cool and focused on improving the car and by the time we got to the race we were able to be in the fight once again. We've had almost no testing this season so we are definitely at a disadvantage but we've managed to show how strong we can be regardless. Last year we were the fastest car at Watkins Glen so we are definitely looking forward to going back there and fighting for a podium! Lexington, Ohio - May 7, 2018 - AFS/PR1 Mathiasen Motorsports finished sixth this weekend at round four of the 2018 IMSA Weathertech SportsCar Championship, the Acura Sportscar Challenge at Mid-Ohio, marking it their best result of the season. It took all three practice sessions to get the balance of the car where the drivers needed it in order to feel fully confident, but AFS/PR1 Mathiasen Motorsports hard work paid off with Gustavo Yacaman achieving their best qualifing effort of the year with the seventh starting position, and the best out of the LMP2 entries and only a few tenths off the top contenders. Yacaman started the two-hour and forty minute race with great momentum. With no yellow flags, the field was able to settle in and fight for pace. After completing half of the race as one of the quickest cars on track, Yacaman handed off the #52 Ligier JS P217 to his fellow Columbian teammate, Sebastian Saavedra. Saavedra maintained the pace set-up by Yacaman and took charge of the 2.4-mile circuit. In the final pit stop, the crew of AFS/PR1 Mathiasen Motorsports made the decision to keep Saavedra on used tires, which led him straight into a battle with the #99 JDC-Miller Motorsports Oreca LMP2 machine. Saavedra kept the fight alive for the remainder of the race and managed to hold off the #99 to finish in 6th place, AFS/PR1 Mathiasen Motorsports best result of the season. The fifth round of the 2018 IMSA WeatherTech SportsCar Championship, the Chevrolet Sports Car Classic, will be in Detroit, Michigan. The 100-minute race will take place on Saturday, June 2. “I’m pretty happy with how we have developed the car so far. We have made huge improvements, especially here at Mid-Ohio with how we started the weekend compared to how we finished. Very happy with the team and the crew. The car ran flawlessly all weekend and now I’m really looking forward to the rest of the year because we have a car we can race with." “Incredibly excited to have finished 6th. I think this is the first event of the season where we were able to put everything together. We had a huge evolution throughout the weekend from where we started with the car. We came in with a car that was not there, but we kept calm and AFS/PR1 Mathiasen did everything they could to make the car amazing to drive. It was really a delight to drive throughout the whole event. Kudos to everyone here on the team, and thank you to everyone for all the kind messages and good vibes. We are looking forward to Detroit." "I'm very proud of the AFS/PR1 Mathiasen Motorsports team, it was a very strong result and something that has been building during the whole season. It's a good feeling to know that we can be fighting with the the top guys up front and that even though we started at a disadvantage not being able to test at all, we are definItely catching up quickly. It was a flawless weekend for the team and drivers, everyone did a great job and I cant wait to keep this momentum up as we go into the rest of the season." "I wasn't able to attend the Mid Ohio race but did watch it on TV. It's a real challenge to compete against the manufacturer supported DPi's so I primarily focus on how the team is performing against the other P2s. To that end it was a great weekend with a strong qualifying effort with the ability to maintain and then improve on that position and eventually have our best finish so far in 2018. The team is improving every race. The competition between Saveedra and Simpson during the closing laps was fun to watch. I wish we were competing in a separate class for the P2s. Now that would greatly enhance our experience at the races!" Long Beach, California – April 17, 2018 - AFS/PR1 Mathiasen Motorsports finished 11th in the prototype class at the Bubba Burger Sports Car Grand Prix, which marked the third round of the 2018 IMSA Weathertech SportsCar Championship. Gustavo Yacaman qualified 9th and had the quickest lap time of the of the LMP2 cars among the more dominant DPI machines. The start of the race looked promising off the line, but when Turn 3 came on the first lap, Yacaman was taken out by Kyle Masson of the #38 Performance Tech car who hit him in the back and spun him out. The Columbian fell to the back of the field but eventually climbed all the way back up into the top ten on the difficult 11-turn street circuit. Sebastian Saavedra entered the #52 Ligier JS P217 during a full course yellow. After the race came back up to speed, Saavedra suffered an incident in Turn 9 resulting in an extra trip to the pits to repair some damage to the nose of the car. Despite the setback, Saavedra did his share of fighting back and held on to his damaged car to cross the finish line in 11th place in the prototype category. Next up, AFS/PR1 Mathiasen Motorsports will travel to Mid-Ohio where they are looking to claim their first top 10 result. "In the end, it was a disappointing result. At least we keep showing that we are picking up the pace and race by race we are improving. We are finished with the hardest races for us - Daytona, Sebring, and Long Beach. Now we move on to more normal race tracks like Mid-Ohio, which I'm really looking forward to because I think we have a more competitive car there. We will keep our heads down and keep working and digging so we can bring a result soon." "We made real gains with the car since the first race of the season. With our only testing coming at the roar and no additional testing, this season has been tough. Gustavo's times were quick enough to claim quickest LMP2 car which put us ninth on the grid for start of the race. The car was not the best car in the race but we were gaining spots until the wall incident that Sebastian had in turn 9 damaged the car was too much and we had to coast home. Bobby Oergel, Tim Lewis our engineer, and his longtime AFS/PR1 Mathiasen crew did another great job." "I’m very proud of the team as a whole, Gustavo did a great job in quali being the quickest of the LMP2s and we had a realistic shot of a top-5 finish in view. Fighting hard on the streets of Long Beach is always a gamble, and this time unfortunately we lost that gamble with some wall contact. But we know we have the potential to be up there and now we just need to keep working and show up in Mid-Ohio again looking for a strong result. Sebring, Florida – March 19, 2018 - AFS/PR1 Mathiasen Motorsports finished 11th at the Mobil 1 12 Hours of Sebring presented by Advanced Auto Parts this past weekend. The new team showed promising speed despite multiple trips to the garage during their second race of the 2018 IMSA Weathertech SportsCar Championship. Sebastian Saavedra started 13th on the grid, which resulted from a spin on his flying lap during qualifying where he showed promising speed. The Colombian quickly made up for it after the green flag, making his way up to ninth place. Saavedra found trouble in Turn 17 when his #52 Ligier JS P217 spun and made contact with another competitor. The first trip to the pits for repairs only cost the team one lap, which Saavedra gained back and drove right back into the fight. On lap 117 an unfortunate electrical issue sent the car to the garage, and the crew of AFS/PR1 Mathiasen Motorsports worked away to fully resolve the problems. The remaining six hours of the race built confidence in the driver and crew as they showed great strong pace – something previously struggled with at Daytona. Besides the result, the car showed it had speed and that AFS/PR1 Mathiasen Motorsports will be a strong contender for the rest of the 2018 IMSA Weathertech SportsCar Championship. Sebastian Saavedra and Gustavo Yacaman will follow the crew of AFS/PR1 Mathiasen Motorsports west across the United States to Long Beach, California for the Bubba Burger Sport Car Grand Prix taking place on April 14th.